I have a serious confession to make. 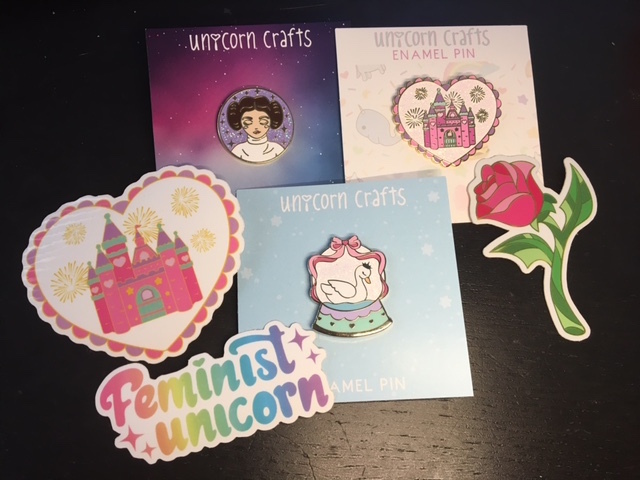 Apart from all my paper love and sticker love, there is one other thing that I simply MUST have… PINS. Not just any pins, mind you, enamel pins, specifically those that make me happy. Or remind me of a time or event that was special to me. Because of their size, they are easy to transport and even easier to store. Functionally, you can always use them to add a bit of flair to whatever you might be wearing that day. And the great part is you can be blatant about it, or a little more low-key. They’re perfect. That’s where Unicorn Crafts comes in. I’d been eyeing their products for a while, but I decided I needed to investigate a little closer, and boy, am I glad I did! Between the enamel pins and the vinyl stickers, I am extremely happy. I see sparkles in ALL of it. And I cannot wait for my next order! Do you collect enamel pins? Do you have an enamel pin you are looking for?